Never thought you were real. 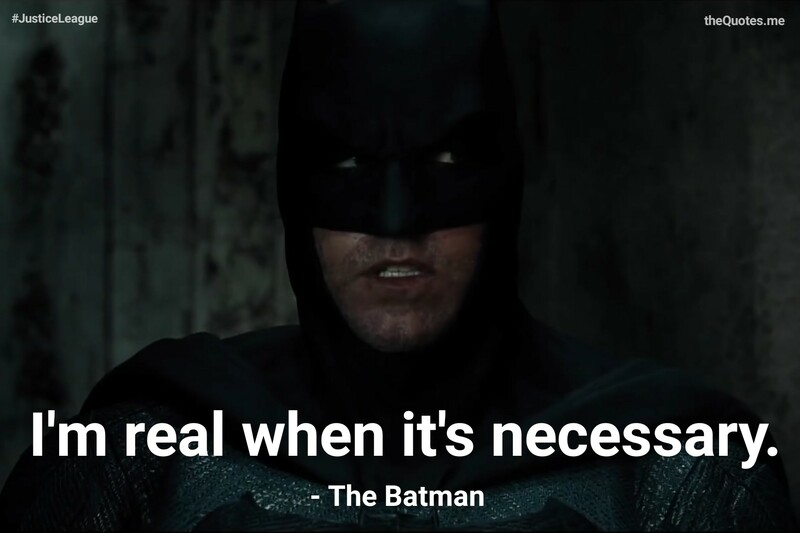 Cyborg wasn’t sure if The Batman was real. I’m real when it’s necessary. 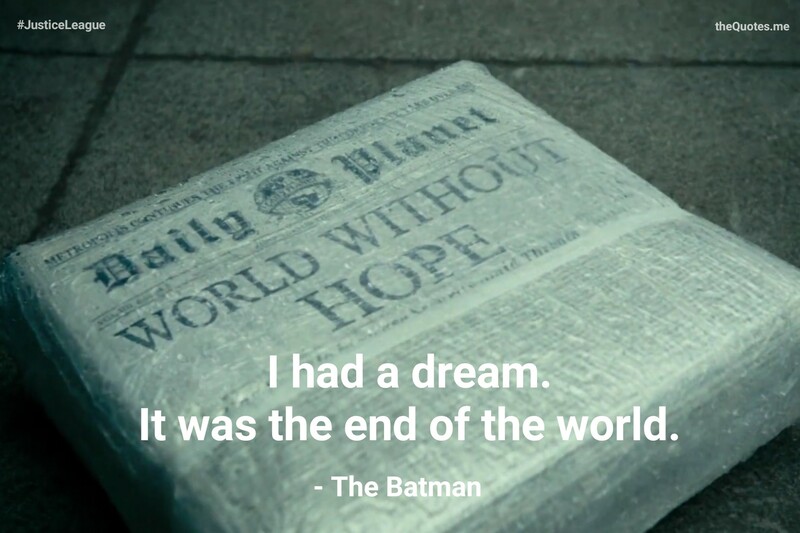 Author theQuotes.mePosted on April 10, 2018 April 1, 2018 Categories Actors, Ben Affleck, Comic Book Adoptions, DC Comic Movies, Fictional Character, Justice League, Movies, The BatmanTags action hero, Alfred Pennyworth, All In, Amazon, Aquaman, Arthur Curry, aspiring superhero, award-winning journalist, Metropolis newspaper, Barry Allen, based on comic book, based-on-comic, Batman Quote, Ben Affleck, Bruce Wayne, caped superhero, City Of Metropolis, Clarke Kent, comic book adoption, comic book movie, Comic Book Villain, Comic Quote, comic-hero, Commissioner Gordon, costume, costumed hero, costumed vigilante, Cyborg, Dark Theme, day vs night, DC Comics, DC Extended Universe, Death, Death of a Superhero, Diana Prince, Diane Lane, dream, End of the World, ensemble cast, eye laser, eye laser gun, eye scanner, Ezra Miller, fake, fake identity, female comic book character, Gal Gadot, Golden Age Comic, good vs evil, Henry Cavill, Human Alien Relationship, investigative reporter, J. K. Simmons, Jason Momoa, Jeremy Irons, Jerry Siegel, Joe Shuster, journalist, Justice League, Kal El, laser gun, Legends, Lois Lane, Man Of Steel, Martha Kent, Memorable Quotes, Metropolis, Metropolis City, Metropolis The City, Movie Quote, necessary, newspaper, newspaper editor, November, original, Pittsdale, Ray Fisher, Real, recruitment, Relationship, Resurrection, right vs wrong, ring, Sam Lane, sand, secret-identity, sequel, super hero alliance, super speed, Superhero Death, superhero movie, superhero quote, superhero team, superhero team up, superhuman, superhuman movie, superhuman team, superhuman team up, Superman, supernatural-power, superpower, Supervillain, surrealism, symbol of hope, team up, The Batman, The Daily Planet, The Dark Knight, The Flash, The Superman, tough-guy, Trailer Quote, Unite The League, Unreal, Victor Stone, vigilante, warrior, Wonder Woman, year 2017, Zack SnyderLeave a comment on Never thought you were real. Bruce Wayne having a planning session with Diana Prince regarding Arthur Curry The Aquaman. 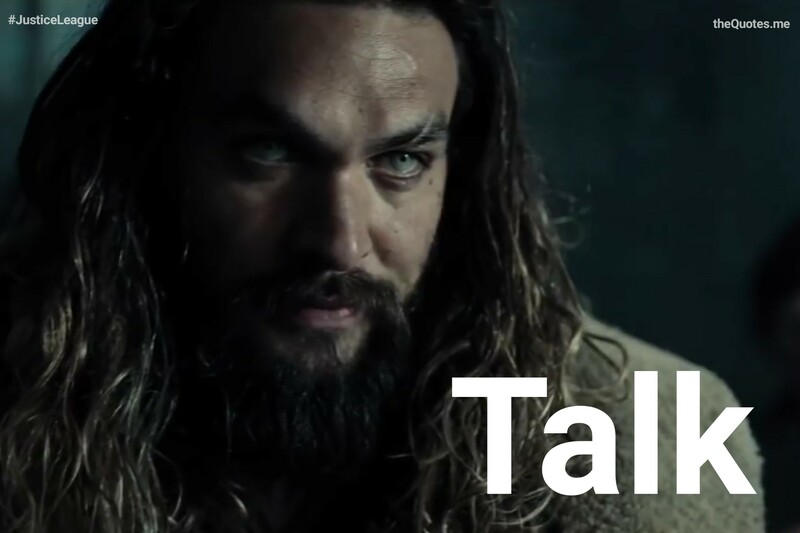 When Bruce said Arthur Curry is willing to join, she didn’t believe at first. 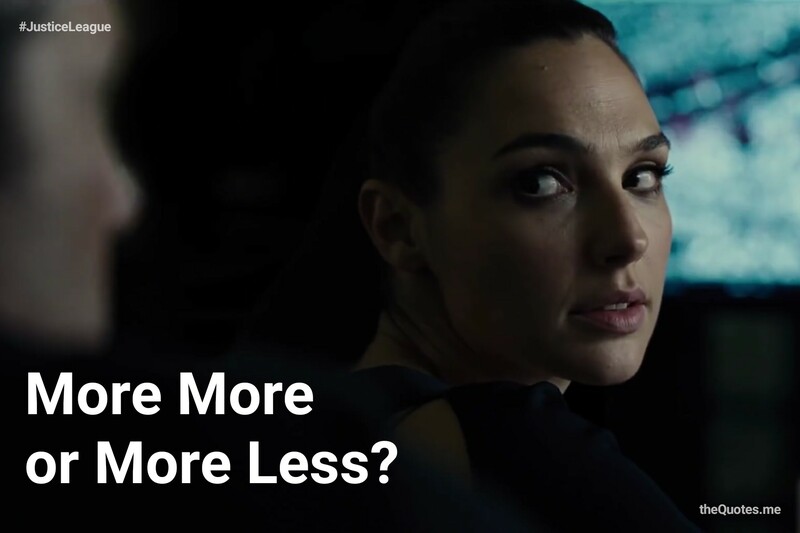 Diana: More more or more less? Bruce Wayne: … Probably, more less..
Diana: So he said, No! 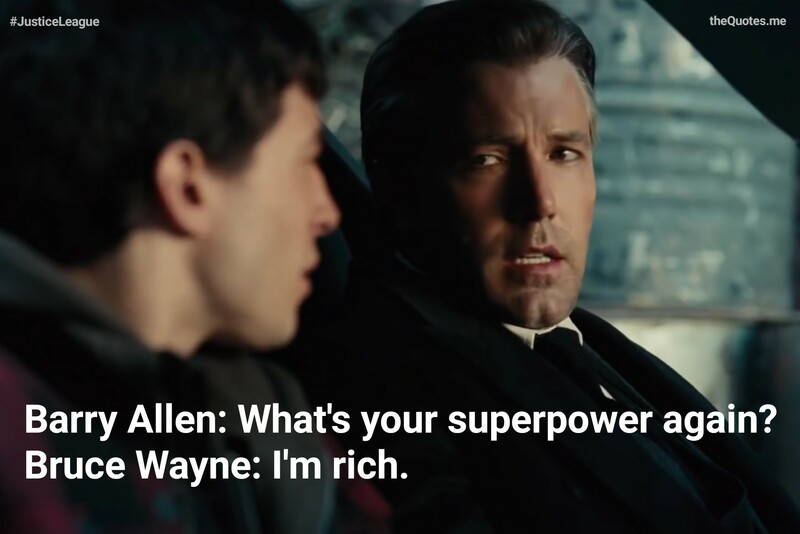 Bruce Wayne: He said, No. I don’t believe it. What are you? 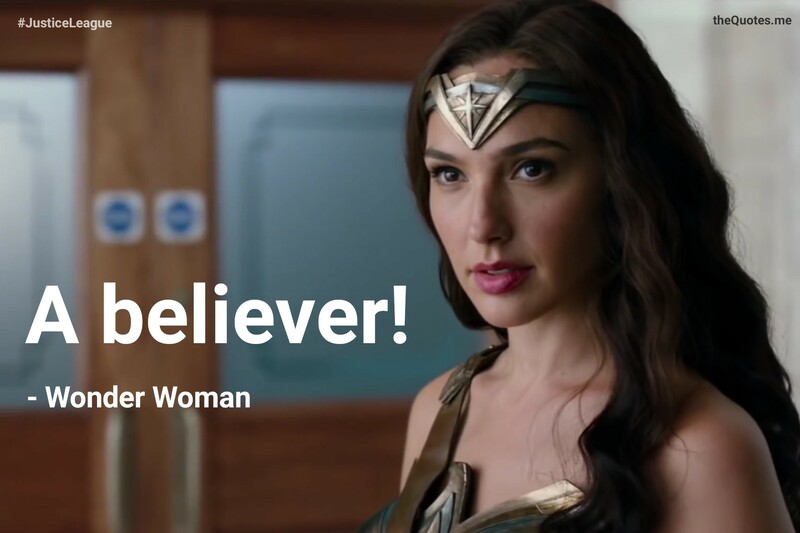 Author theQuotes.mePosted on December 3, 2017 February 2, 2018 Categories Actors, Comic Book Adoptions, DC Comic Movies, Fictional Character, Gal Gadot, Justice League, Movies, Wonder WomanTags action hero, Alfred Pennyworth, All In, Amazon, Amazonian Warrior, aspiring superhero, award-winning journalist, Metropolis newspaper, Barry Allen, based on comic book, based-on-comic, Batman Quote, belief, Believe, believer, Bruce Wayne, caped superhero, City Of Metropolis, Clarke Kent, comic book adoption, comic book movie, Comic Book Villain, Comic Quote, comic-hero, Commissioner Gordon, costume, costumed hero, costumed vigilante, Cyborg, Dark Theme, day vs night, DC Comics, DC Extended Universe, Death, Death of a Superhero, Destiny, Diana, Diana Prince, Diane Lane, do you wonder, dream, End of the World, ensemble cast, eye laser, eye laser gun, eye scanner, Ezra Miller, fake identity, female comic book character, Gal Gadot, Golden Age Comic, good vs evil, gotham, Greek god, Human Alien Relationship, immortal, investigative reporter, island paradise, J. K. Simmons, Jason Momoa, Jeremy Irons, Jerry Siegel, Joe Shuster, journalist, Justice League, Kal El, laser gun, Legends, Lois Lane, Love, love interest, love interest of superhero, Metropolis, Metropolis City, Metropolis The City, Movie Quote, newspaper, newspaper editor, November, paradise, Patty Jenkins, Pittsdale, Ray Fisher, recruitment, Relationship, Resurrection, right vs wrong, Sam Lane, sand, Save The World, secret-identity, sequel, simple quote, super hero alliance, super speed, Superhero Death, superhero movie, superhero quote, superhero team, superhero team up, superhuman, superhuman movie, superhuman team, superhuman team up, supernatural-power, Supervillain, surrealism, sword and fantasy, team up, The Batman, The Daily Planet, The Flash, The Superman, tough-guy, Trailer Quote, two word quote, Unite The League, Victor Stone, vigilante, war, warrior, woman fights a man, Wonder Woman, Wonder Woman Quote, year 1918, year 2017, Zack SnyderLeave a comment on I don’t believe it. What are you? 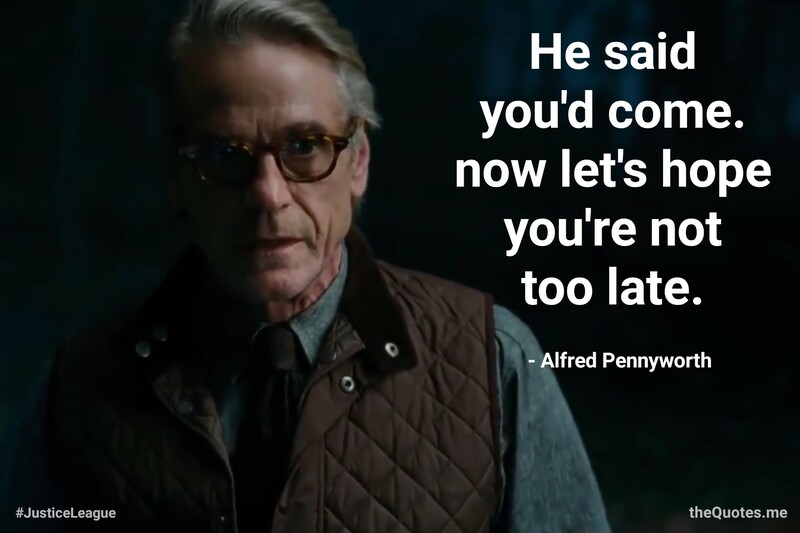 Author theQuotes.mePosted on November 27, 2017 February 2, 2018 Categories Actors, Aquaman, Arthur Curry, Comic Book Adoptions, DC Comic Movies, Jason Momoa, Justice League, MoviesTags Across the Sea, action hero, Alfred Pennyworth, All In, Amazon, Aquaman, Aquaman Quote, Arthur Curry, aspiring superhero, award-winning journalist, Metropolis newspaper, Barry Allen, based on comic book, based-on-comic, batman, Batman Quote, Ben Affleck, breath underwater, Bruce Wayne, caped superhero, City Of Metropolis, Clarke Kent, comic book adoption, comic book movie, Comic Book Villain, Comic Quote, comic-hero, Commissioner Gordon, costume, costumed hero, costumed vigilante, crowd, Cyborg, Dark Theme, day vs night, DC Comics, DC Extended Universe, Death, Death of a Superhero, Diana Prince, Diane Lane, dream, End of the World, ensemble cast, eye laser, eye laser gun, eye scanner, fake, fake identity, female comic book character, Golden Age Comic, good vs evil, Human Alien Relationship, investigative reporter, island, J. K. Simmons, Jason Momoa, Jeremy Irons, Jerry Siegel, Joe Shuster, journalist, Justice League, Kal El, King Wave, laser gun, Legends, Lois Lane, Love, love interest, love interest of superhero, love interest of superhuman, love interest of Superman, Man Of Steel, Martha Kent, Metropolis, Metropolis City, Metropolis The City, Movie Quote, necessary, newspaper, newspaper editor, November, ocean, oceans, one word quote, original, Pittsdale, Protector of the Seas, Quotes from trailer, Ray Fisher, Real, recruitment, Relationship, Resurrection, right vs wrong, ring, Sam Lane, sand, Save The World, sea, secret-identity, sequel, shore, super hero alliance, super speed, superhero, Superhero Death, superhero movie, superhero quote, superhero team, superhero team up, superhuman, superhuman movie, superhuman team, superhuman team up, Superman, supernatural-power, superpower, Supervillain, surrealism, symbol of hope, talk to fish, team up, The Aquaman, The Batman, The Daily Planet, The Dark Knight, The Flash, The Superman, tough-guy, Trailer, Trailer Quote, underwater, Unite The League, united, Unreal, Victor Stone, vigilante, warrior, water, waves, Wonder Woman, year 2017, You Can't Save The World Alone, Zack SnyderLeave a comment on Talk.